The Age of Miracles is the story of twelve-year-old Julia. She plays soccer, along with her best friend Hanna, and the last time that Hanna slept over at Julia’s house before a soccer game, the world started to end. That morning, before the soccer game, scientists announced on television that the rotation of the earth on its axis had begun to slow, perceptibly, and that just as there was no known cause, there was as yet no known solution. And what comes after that? A beautifully-written, keenly observed story about growing up: the friendships that fall apart, the first loves, the loss, and the countless disappointments, against the backdrop of an impending catastrophe, in some ways not that different from the changing, uncertain world you and I grew up in. There are so many examples of Karen Thompson Walker’s prose that I could share with you to try to incite you to read this book, but I’d be cheating you of the distinct pleasure of discovering it as you read, and a collection of quotes doth not a blog post make (generally speaking). Just…read this book. If there were some hallmarks of the first novel, if the foreshadowing felt, at times, a little heavy-handed, I ended up forgiving it. 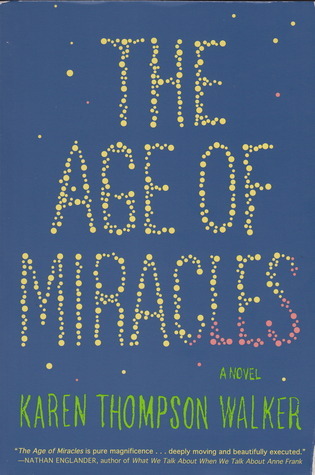 This entry was posted in Books, Reviews, and Reading and tagged books, coming of age, elastic realism, Karen Thompson Walker, reading, science fiction, The Age of Miracles on September 26, 2013 by ms.grammarian.